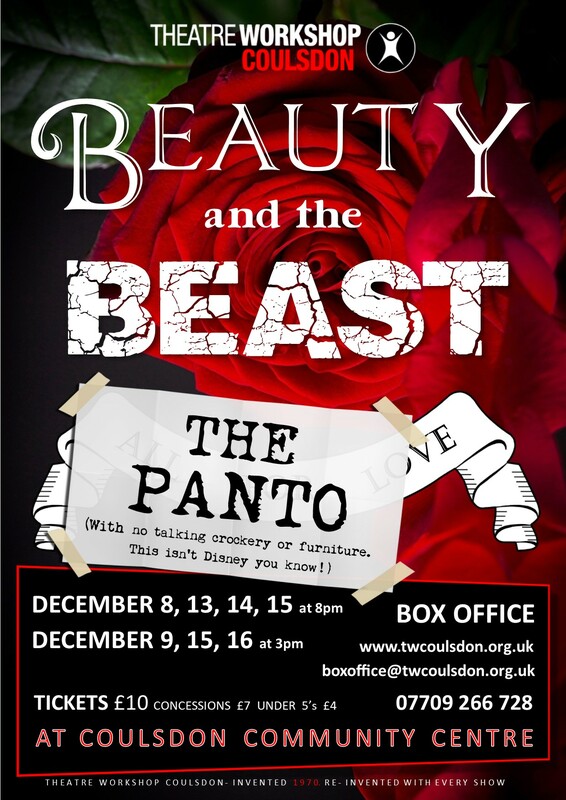 Theatre Workshop Coulsdon’s Christmas 2018 production is our take on the much-loved fairy tale ‘Beauty and the Beast’, the classic story of why you should never judge a book by its cover – or a Beast by its horrid, hairy appearance. But this is no Disney cartoon copy, oh no! This is a brand-new traditional-style pantomime with all the classic elements that make a good panto the rocket fuel that launches the festive season, guaranteed to delight young and old, from kids to grandparents. You can boo the wicked witch that is Deadly Nightshade. You can cheer on the lovely Beauty, but hiss at her appalling ugly sisters. Audience participation is positively encouraged! With a full band, lots of songs, a script choc-full of cracker jokes and a host of larger than life characters, this is best way to kick-off your Christmas. Will the tragic transformed prince, doomed to live out his life shunned by all, be rescued by true love? Find out this December! On stage at Coulsdon Community Centre for seven performances – Saturday 8th, Thursday 13th , Friday 14th and Saturday 15th December all at 8pm, with 3pm matinees on Sunday 9th, Saturday 15th and Sunday 16th December.